Our personal 2017 Highlight are destination weddings which are a complete package. For example, one can rent a house with one’s family and friends and thus also have the opportunity to explore the area on a group excursion. A wedding is then the climax of a shared trip. The 2017 trends are all characterised by their sustainability. A wedding with simple essentials and the individuality of the bride and groom are especially the focus of the gatherings of the coming wedding season. The trend is more towards DIY elements and informal, casual weddings. In our first part of the 2017 wedding trends, we want to tell you everything about the 2017 colour trends and share our own personal ideas and highlights. The colour trend in 2016 was the bright and radiant colours of Peach and Serenity (a very bright shade of blue). These colours will also continue for jewellery, decoration and make-up in 2017 and will be refined by golden accents. Gold flower vases paired with magically bright flowers or long gold spillar candles arranged in a pink table decoration are just a few ideas for combining the trend colours. Particularly earthy and pastel colours, such as copper, caramel and beige, can be easily used for displays for weddings, particularly in spring and autumn. These colours can be mixed with dominant colours, for example with vibrant blue tones. Beige and blue in the mix always remind us of beautiful days at the sea with sandy beach and sea air. The sunshine is still there with the golden accents, which we will often encounter in the next year in decoration, make-up and jewellery. Colours such as peach and light peach are then mixed with fine white or golden shades in summer. Open/hair down bridal hairstyles in the Undone look, curls or even braided elements are the hair trends for 2017. Severe updo wedding hairstyles were yesterday. The bride should look fairy-like and magical and feel so. In order to spice up the Undone look, the hairdresser can still rely on elaborate hair jewellery made of flowers or gold-decorated clip-in extensions. Floral crowns also offer a quite wonderful 2017 wedding look. The naturalness of the styling extends to the wedding bouquets and table decoration. They will also be rather loosely bound in 2017. Natural wild flowers and rustic arrangements are used for this. 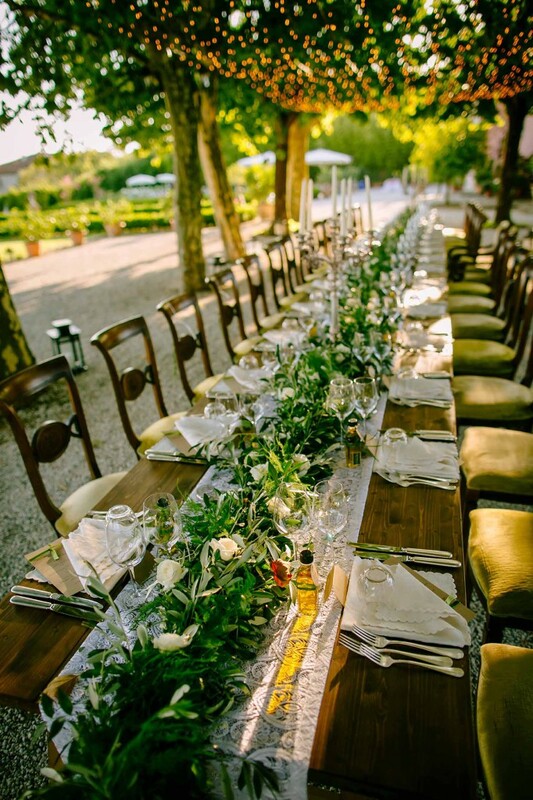 Especially for a wedding in Tuscany it is also possible to make use of seasonal and regional flowers and plants. Natural and simple floral decorations, which can be dotted here and there with exotic details are therefore the trend.